I couldn’t resist this gorgeous artwork. 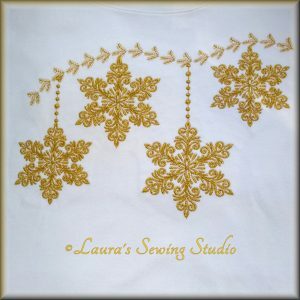 I immediately had in mine to sew them with gold metallic thread on a white knit top. If you need a quick what to wear to a (perhaps unexpected) get together for the holidays this will do it for you. A top with fancy pants or skirt and you are ready to go. My top is a simple cotton Walmart top. It is short sleeved but then we get very little cold weather in Houston. You probably have an un-decorated top in your closet to adorn with one of these arrangements or just one or two singles. These are one color designs. The arrangements have color stops to allow you to change thread colors should you wish to do that. I sewed the white top with all the same thread and color. Wonderfil pre-wound bobbins are my mainstay. This thread is a #80 weight tough polyester thread that makes the embroidery lighter weight. 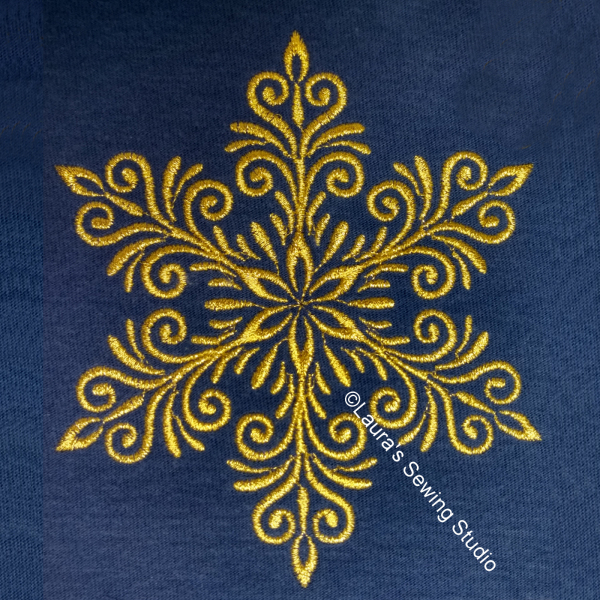 I use medium-weight, cut-away stabilizer for these sew outs.